You may have heard on the news that Woodward, Oklahoma was hit by a large tornado on Sunday, April 15, resulting in six deaths, many injuries, and many homes and businesses destroyed. Despite that very horrible news I am happy to report that the Selman Ranch, where we will view the Lesser Prairie-Chickens, sustained no damage, and our headquarters, the Northwest Inn, also was not damaged. So the Festival will proceed as planned. I received a call a few days ago from photographer Noppadol Paothong’s office. He was interested in being part of our festival. If you don’t know Noppadol is a world-class photographer from Missouri, where he photographs for the Missouri Dept of Conservation’s Missouri Conservationist magazine. That is one of the largest and most well-regarded state magazine in the country. 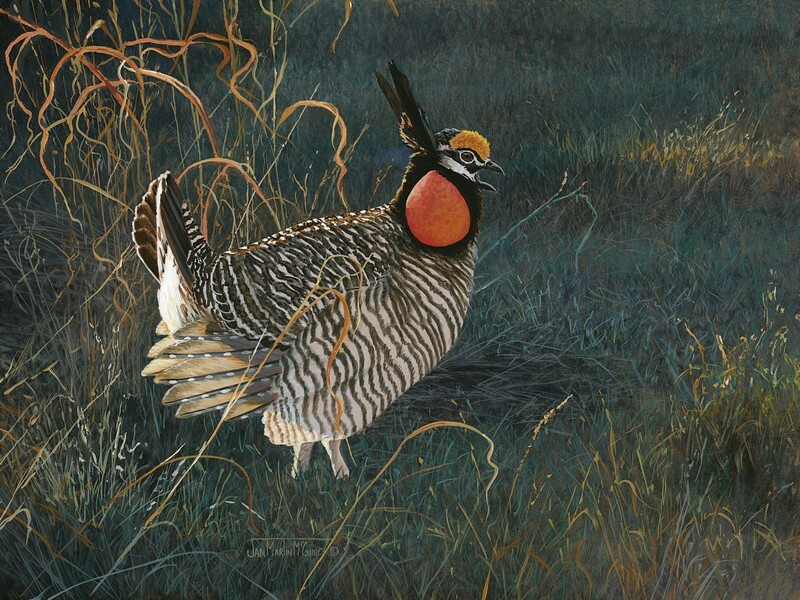 And on top of that, Noppadol is working on a book about the North American prairie grouse, including the Lesser Prairie-Chicken. He has been to the Selman Ranch several times in the last few years to photograph the birds. After discussing it with him, we are going to offer a full day workshop with Noppadol, the morning in the field and the afternoon in the classroom. We won’t be photographing the chickens with him (since that is essentially a solitary activity in the blind) but we will visit the lek area and Noppadol will offer his suggestions on how to best photograph them. This will mesh nicely with the Photographer’s Packages we’re offering, and I’ve substituted the workshop for the package on Friday. Sue Selman suggested we may want to consider offering something special for photographers. And we have now come up with a plan, called the “Photographer’s Package”. If anyone has a suggestion for a jazzier name, let me know! It will include use of a blind dedicated to photographers, with a max of 2 people, so there will be no back rows. And after finishing up at the blinds, you will have full access to the Selman Ranch for the entire day. Sue will also have a blind set up near a wildlife feeding station and water source, which can draw in other larger wildlife, especially in the evening. 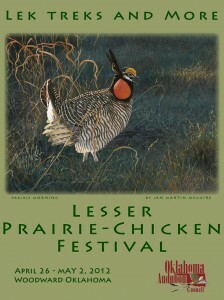 I’m thrilled to announce that Jan Martin McGuire has agreed to be the Featured Art for the 2012 festival! 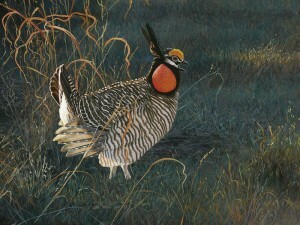 Jan in an internationally known wildlife artist from Bartlesville. I first met Jan some 20 years ago after we moved to Oklahoma, and have followed her career over the last 2 decades, becoming one of the top wildlife artists in the world. This is exciting! With the help of Dwayne Elmore, we have lined up a private ranch in Osage County (in northeast Oklahoma, next to the Nature Conservancy’s Tallgrass Prairie Preserve) on which to offer viewing of Greater Prairie-Chickens! We will do this as a pre-festival event, so folks wanting to get kick-@#$ views of the GPCH can arrive in Oklahoma a day before the main festival activities, and then head on over to Woodward to get the Lessers. I have just confirmed that Jeff Gordon will be our keynote speaker for the 2012 Festival! And no, we are not pursing a NASCAR sponsorship! Jeff is the new president of the American Birding Association, and we need to show the ABA some Lesser Prairie-Chickens!